1. Took Batt out - Tested bad - purchase and replaced Batt. 2. Took out Started - Tested Good - put starter back. 6. Made sure all doors were shut solidly. 8. Nearly got divorced over it. This morning after having my coffee I decided to take a chance and try to start the car. I turned the key and it did the same thing accept when I held the key to the start position for about 5 sec it finally turned over and the engine started. After that I turned the car off and turned it back on several times with no delay. I personally think that the Ign Switch could be the problem. Its just to bad I did not figure it out sooner. Thanks for the info and I am going to check out the Ign Switch as per your instruction tomorrow. Yesterday morning I got up and went out for the coffee again. The PT did not start. Did not start all day. Have not had the heart to go out this morning and try it yet. Testing this morning. 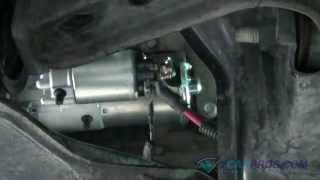 Dont know how or why but after installing a new starter the car is working fine. Just thought I would post this to help others know that sometimes the testing machine is wrong. Here is the starter wiring diagrams so you can see how it works. Please let us know what happens. Ok.. the car is up to its old tricks. Wont start... just clicks once when the key is put in start. I was thinking about changing out the Ign Switch and got into the column and found what you see in the picture. Looks like the previous owner took something out of the car that they had added and put a piece of wire with wire nuts on the yellow wire (see the pic) Now... I went to look to find out how much this wire harnes is and they want $1900 for the part!!!!! The first question is could the wirenuts be causing my problem and is there some cheaper place to get this part. Other than that... well it is still not starting unless I sit there and turn the key off and on and off and on and eventually it will turn on. Sounds like the igntion switch has to catch its sweet spot on the start circuit of the switch to crank the engine over. Ok. I replaced the Ignition Switch and it still does the same thing. Someone told me something about a switch in / arround the transmition but I dont think that would be the problem because if I put the transmission in drive and try to turn the car over it dose nothing. Not even click. Someone else said something about a linkable fuse but I dont know where that is so Im not real sure that could be the problem. Im taking out the starter in the morning and run it to PepBoys for them to test it again along with the Batt. Just to hear them say the starter is fine and then I will put it back in and the car will start fine. Anyone have any other ideas? I have 24 hours to get this thing back up and running. When I was going over all the data. And putting in new relays and fuses. Which did not work. I removed the Batt. And got the strange idea to quickly move the wires around the starter and hook the Batt. Back up and see if it would start. Well. Me being lazy like I am sometimes. I hooked the Batt back up using jumper cables. Well. As you know there is not enough power to run the car thru the jumper cables but it DID however show me that if I hooked up and tried to start the car. I started getting the click click click of a dead Batt. I put the Batt. Back in the car and low and behold the car started. I moved the cable that goes to the ALT. And it started just doing the single click again. I looked at the wire I was moving and noticed on the wire it said "Fusable Link". I had read where people had had problems with this part before with the same starting results. Not knowing what a fusable link really was I called around to NAPA as well as the Dealership and found that you dont purchase a linkable fuse you make one. The dealership wanted some un-godly amount of money to purchase the entire engine wireing harnes but NAPA had 10 gage wire which was all the fuse was. I talked with a couple of nice service people at the dealership and they told me to save the money and just clip the wire close to the fuse. Strip the 8 gage wire. Sauder the 6 inches of 10 gage to the 8 gage then put a round connector with a hole back on the end of the 10 gage. This would still be a "linkable Fuse" and do the job of the old one without having to replace the entire wire harness. SO. For about $4 in parts I put the wire in and the car has never started better or faster than it does now. I pulled the old fuse apart to look at the wire and did find some green junk on the copper. Seems that somehow mosture or water got in that wire and was causing a bad connection and not providing enough power to the starter to turn over. I am just praying that this has solved the problem for good. Thanks to everyone who posted to help me out. I will continue to use the information and hope my story helps someone figure out their problem. And a HUGE thanks to 2carpros. Com. I will sing the prasies of this site for a long time to come! Ok. False alarm. I THOUGHT I had it fixed. Having the same problems again. I am re-opening this question. Any more ideas of what to check? Starter Relay has been replaced even though it tested good. Did you ever find out the problem? My son's car is doing the same thing! We changed the battery, put a new starter, then it would not crank, took it to the shop, it cranked the day we were taking it. The shop kept it for 2 weeks and it cranked every time they got in it. Well today August 24th, 2009. It is doing it again. I would really love to know if this was ever fixed. I just purchased a 2002 PT Cruiser Base for my wife and these are the exact symptoms my wife's car has. I have tested the battery (good), starter (good), fusible link on both sides (good), replaced neutral safety switch. Aka. Transmission range sensor (good), I have tested all fuses (good), I can start the car only with the key in the ignition (run position) and jump the starter and I can start the car with the key in the ignition (run position) and jump the starter relay (good). I have power to the fuse box under the hood and under the dash. I have power to the ignition wire (yellow) when turning the key, I have power to the starter wire (blue). Accy works in the 1 position yet not in the run position. There for the radio works when the key is turned back but not when the car is running. I can't turn the key in the ignition to start the car. The car previously had an aftermarket radio put it, which I took out and replaced it with a factory radio. There were several connections made to the wire harness yet the all sides have the correct power. I have no idea what is happening. My only thought would be the ignition actuator pin not pressing the connector in ignition switch. The factory actuator pin is quite long and looks like it is bending. Any thoughts? For the love of.I, too, am having the exact same problem. My daughter in law's 2002 PT Cruiser (75K miles) all of a sudden just didn't start about 2-3 months ago. At first, I thought she left the lights on or forgot to put it in park. But alas, it wasn't her fault. We replaced the battery, just to be safe. Still had the same problem. Now, we tried it every day (temp and weather were unchanged) and some days it would start right up and some days it wouldn't. It would simply click, all electronics would go on (radio/dashboard/lights/etc), but just a click. It wouldn't turn over. After checking all fluids and connections/cables, we couldn't find anything wrong. After not starting one night at a baseball game, a kind gentlemen stated that he had a problem with his car similar to ours and he advised to get something hard to bang on the starter. We did that and BOOM, it started. Brilliant! Fixed. NOT! 2 days later, just a click. 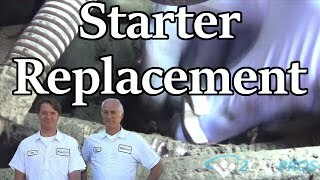 So, we explored getting a new starter. We replaced the starter early June and for 2-3 weeks, it started right up. Then, same thing. Just a click. We tried banging on the starter, jumping the car with another vehicle. Sometimes it worked, sometimes it wouldn't. There really was no rhyme or reason. We finally took it to the Chrysler dealership and because it didn't act up for them at all (they had it for 5 days total), the diagnostics showed nothing wrong. They gave it the all clear since it started right up but of course, right after we brought it home, the same problem. Just a click. At this point, I resorted to YouTube to determine DIY checks that I could do and I took apart the steering cover and dissembled the ignition cylinder/switch/actuator and could not find a problem. I took it to the dealership and they said it was just fine. The actuator pin was working correctly and nothing was wrong with the ignition system. After back and forth with me scratching my head and throwing things, I took the car to a local mechanic and he stated that because the starter we used was 'refurbished', it was probably due to a bad starter. Ok. So we used the warranty and got another one. SAME PROBLEM! 3 starters, 2 batteries and hours of frustration, not to mention over $400 of mechanics telling me there is NOTHING WRONG with the car. It still won't start. It just clicks. For the love of all that is good in this world, can anyone tell me what the problem is? I'm at a loss. 3 mechanics, including a Chrysler dealership tell me there is nothing wrong, but it will not start. And, do NOT ask me if there is gas in the car. I'm not a car expert, but this issue is something caused by the construction of the car, just not sure what it is. Electrical? Computer-related? Security system-related? I see this is an old post but if anyone is still having problems with their PT Cruiser then I may have a possible fix. Several months ago my nephews 2002 Cruiser began have the same starting problems as many others on this and several other sites. Purchased from his grandmother the car has only 128,000 kilometers or around 80,000 miles. Just a click from the solenoid on the starter but not turning over. The first time I just charged the battery and it worked for a couple of weeks. The next time I managed to get it to start again and I m not sure why, just tightening and moving cables I think. Couple weeks later it happened again, just a click like the starter had failed. Since the solenoid was getting power I knew it wasn t a VCM problem or any other link in the chain although I had traded relays just to be sure. The starting circuit is fairly simplistic. I m not one to just replace parts and hope that they fix something unless I can prove a fault. This time I couldn t get it going so I pulled the starter apart, cleaned, lubed and tested it. I could not find any internal problems with the starter and it fired up fine on the bench. It started the car again and did so for another couple of weeks. The anemic sound this car makes when the starter turns over has always bothered me like it just wasn t getting enough current. The factory battery cables look extremely light even for a 4 cylinder car but Chrysler put them there and I would think that they know what they are doing. Thinking I had missed something when testing the old starter, I finally broke down and put in a new one. Fired up again but the anemic sound when cranking over had not changed. Couple more weeks and again no start. Now I d triple checked all of the connections and grounds before this and my gut still said there was not enough current getting to the starter. I have a pickup truck I use for parts on the property so I pulled the main positive wire from battery to starter and over to the fuse box and put it in the Cruiser. Now this cable is much too long but I like the security of the factory terminals when they are in good condition. The wire is also 4-5 times as heavy since it was pulling over a bigger v8 engine. Just looped up the extra cable for now and gave it a try. The starter winged over like I always thought it should and there have been no problems since. My guess Is that the factory cables in the Cruiser are very marginal at best and over time they must somehow oxidize internally at the connections even though they appear to be secure. Check the timing belt. I know that may sound weird. I have a 2007 pt and I drove it all day one day. Parked it, next morning it wouldn't start. Went through replacing a lot of things before tearing it down and checking the timing belt. I know this post is old but if response can help someone than awesome. The camshaft position sensor was replaced @ 201,000. 2 weeks later, the car stalled in traffic and would not restart. No DTCs presented. There was no spark at the #1 plug, the tube was half full with oil. Replaced valve cover gasket, tube seals, plugs and wires. No spark. Broke crankshaft position sensor receptacle while removing connector, replaced sensor. Still no spark, no codes. Tested starter due to never having heard car start, and was not impressed by sound of cranking. Starter and battery both checked sat. No +12vdc @ coil with key on. Jumpered ASD relay, and saw +12vdc @ coil center pin. No start. Swapped horn relay (known good0 no start, no +12vdc. Fuel pump runs, pressure @ fuel rail. Voltage drop @ starter w/in limits. Replaced PCM w/ known good, no start, same conditions, no codes. I've gone to alldata, as Haynes manual has no engine control info.I have schematics, have exhausted all troubleshooting ideas. Could the flywheel be worn to the point it is not spinning the engine fast enough, and setting an ASD shutdown command? What parameters, exactly, cause the ASD relay to shut off? The owner really likes the car, which is in surprisingly good condition, and really can't afford to replace it now. All help would be greatly appreciated. You did not mention anything about the Crank Position Sensor and from symptom description, that should be the component you should concentrate on to get the ignition coil signal. Btw was the ignition coil tested or substituted? Since there is no B+ at the coil, I have not considered the coil as a possible problem/solution. Both cam and crank sensors are new. I am pretty much clueless as to the purpose or operation of the ASD relay circuit. It looks like the PCM sends a ground signal to collapse the coil, but I don't understand the grounding circuit itself. I assume the ground circuit for the injectors is working, as there is fuel in the intake runners. 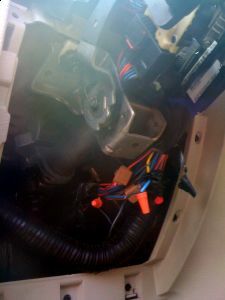 When the PCM is powered by the ignition switch, it would ground the ASD relay via connector C3 terminal # 2 (Dark Blue/Yellow wire). Check for continuity between the PCM and ASD relay for the wire. C3-2 is unpopulated. Alldata shows ASD relay control leaving the PCM on C3-3, via a DKBLU/YEL wire which rings to E2 and E4 on the ASD socket. All the terminals on C3 for the ASD relay ring to the sockets they're supposed to on the relay socket.